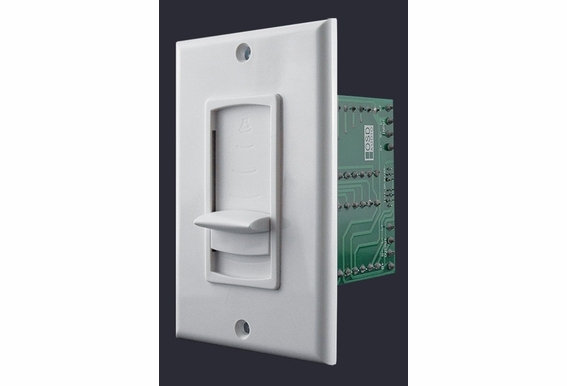 An installer favorite, the VMS300 volume control is rated at 300 Watts peak and gives you the convenience of controlling volume independently in each room. We include a lot of product shots because we want customers to see the build quality inside and out of this decora-style controller with 12-step linear slider. Quality is critical to the successful sonic performance of any whole house audio system and we pay close attention to performance, reliability and durability. The result is a blend of transparency and functionality, with low distortion and ruler flat frequency response. 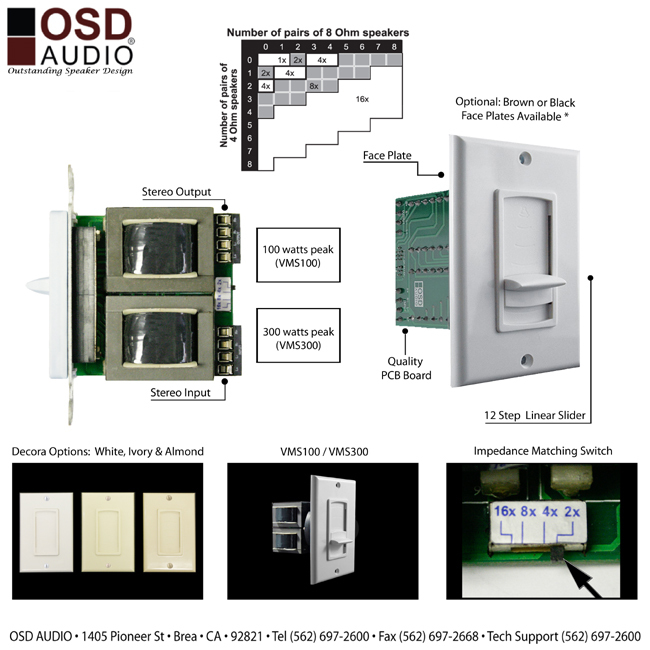 OSD Audio Volume control delivers seamless control for every room in the house and whether you choose knob control or soft-touch sliders, you’ll enjoy convenience, style and colors to match any decor. Designed for whole house audio systems, the VMS300 is a heavy-duty but elegant impedance-matching volume control that offers the same features of volume controls that cost twice as much and is a nice upgrade from outdated rotary version volume controls. Rated at 300 Watts peak with minimal bass roll-off, the VSM300 includes adjustable jumpers to add up to eight pairs of 8-ohm speakers simultaneously depending on what type of load your amp can handle, and the impedance-matching feature helps stabilize the ohm load going back to the amp or receiver to avoid overheating. 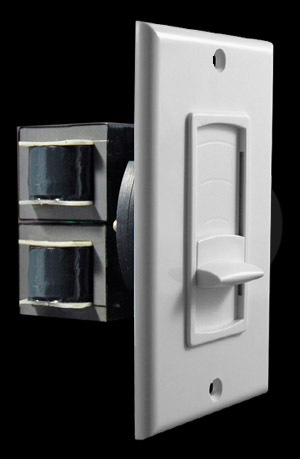 This is a complete volume control kit that fits into a standard single-gang box and includes the VC, junction box, screws and assorted color trim plates (white, ivory and almond) so you can choose the color that best matches the room. Compatible with almost any dedicated audio zone or whole house system, the electronics inside the VSM300 are designed with precision and a ruler-flat frequency response while the 12-step slider provides noise or pop-free volume control and a wide range of listening volumes. Impedance is a somewhat complicated topic but in general terms it is a measurement of resistance to alternating current. Speakers are specified by impedance, and a common value is 8 ohms. 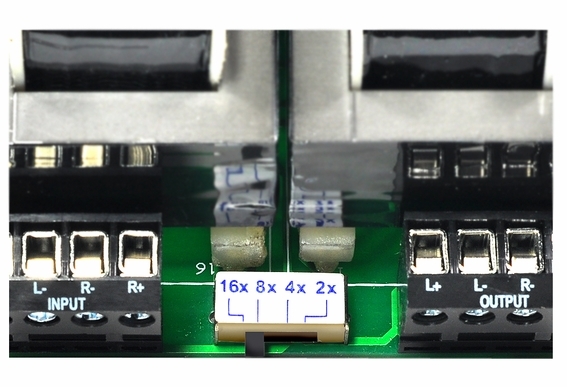 When you’re connecting multiple speakers to a receiver or amplifier, you need to stay above the amp’s minimum load requirements because going below the impedance rating can overheat or even damage expensive equipment. Volume controls such as the VMS300 have selectable impedance so you can literally match the impedance with the number of speakers being controlled with the capabilities of your amp. A basic multi-room system will typically have an amplifier/receiver, a speaker selector, four to eight pairs of speakers, and volume controls. Impedance-matching volume controls feature three settings depending on how many speakers you are connecting. For one to two pairs of 8-ohm speakers, the setting is 1/2x; for three or four pairs of 8 ohm speakers, the setting is 4X. Volume controls do not add gain (volume) to your speakers but simply attenuate the volume up or down. During setup, you'll set the source volume to its optimum level, then the volume control turns the sound down to inaudible levels. It's important to know a few facts about Volume Controls. 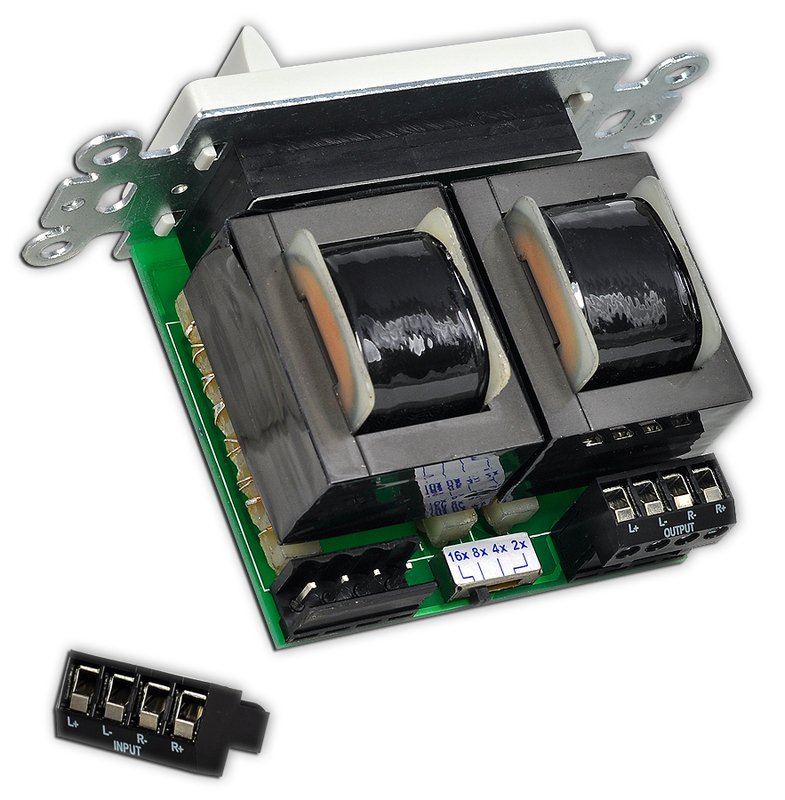 There are two types of volume controllers we offer; Impedance matching and Non-impedance matching. A basic multi-room system will typically have an amplifier/receiver, a speaker selector, 4 to 8 pairs of speakers, and volume controls. 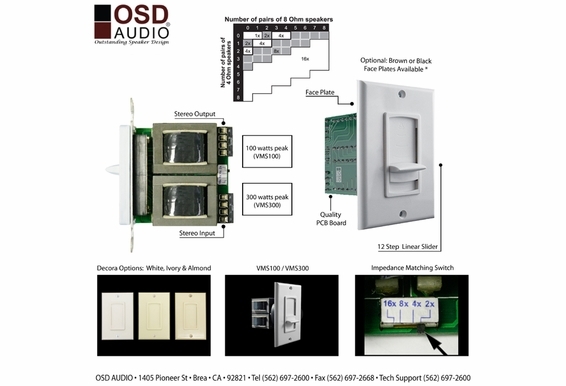 In a basic system multi room system a Speaker selector is used to organize the connection between the Amplifier/Receiver where the Speaker Selector typically has internal impedance protection that is controlled by a manual switch. 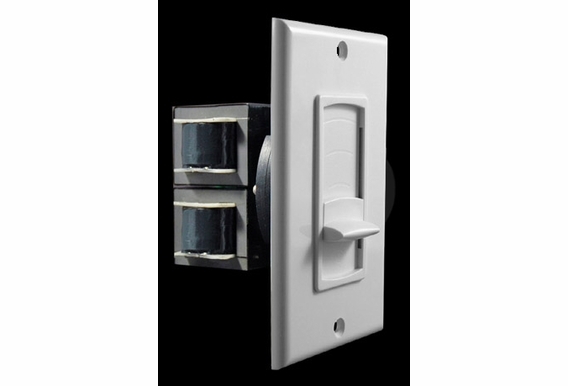 More complex multi-room systems often add Impedance matching Volume Controls for each room/zone. The Impedance matching Volume Controls feature three settings depending on how many speakers you are connecting. 1 to 2 pairs of 8 ohm speakers the setting is 1/2x. For three or four pairs of 8 ohm speakers the setting is 4X In fact, when adding impedance matching, you must turn off (disable) the protection in the speaker selector. Most impedance-matching volume controls feature three standard settings: 1/2x, 4x and 8x, while some add a 16-ohm setting like our VMS series. These settings correspond to a chart in the owner’s manual based upon the type of amplifier (4 or 8 ohm) and the number of 4 or 8 ohm speakers that you will be using in the multi-zone/room/speaker system. Also remember that volume controls do not add gain (volume) to your speakers; they simply attenuate the volume up or down. During setup, you'll set the source volume to its optimum level, then the volume control turns the sound down to almost inaudible levels. I'm putting this system throughout a new home. I have one room that can only use I speaker. Can I wire this one speaker and get both sides of the stereo sound using the VMS 300? Thanks HLK Ps I have already bought everything for the rest of the house. 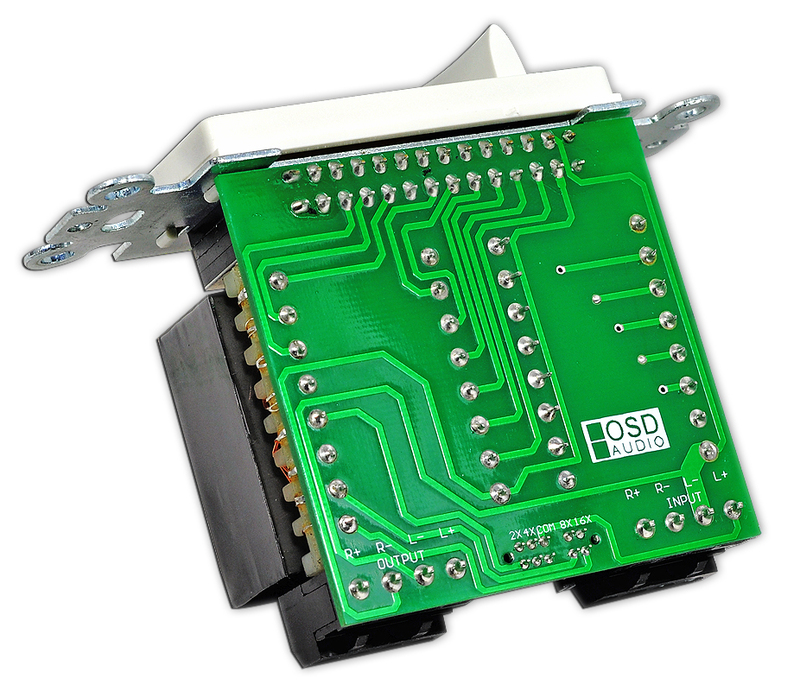 I have a question re: use of OSD Audio VMS300 with a niles SS-6 speaker selector with protection. I am running 6 pairs of 6-8 ohm speakers via this speaker selector and a VMS 300 VC controlling volume for each pair. I am confused as how to set the impedance matching on the volume control and the speaker selector. i am currently set at 16x with protection on. Is this overkill? What would you recommend with regards to settings? I can't find good information anywhere on this. Could i connect 2 pair of LS3 speakers to this volume control. Can the volume control be conected to the center output on my 7.2 sony receiver. I only have one channel availble on my receiver.? Can two VMS300 units be mounted in a double gang box? If so is there a cover plate for that? I have a 4 zone setup with 1pair of 8ohm speaker connected to a vms300 set at 4x in each room. I'm using a spw8 speaker distribution to a nIles amp si-245. Source is the pre out from zone 2 on a onkyo receiver. I've checked all wiring but the amp will go into protection mode if pushing the speakers. Is the 4x setting correct? I am installing a 70v system where i will have two zones. i will have 9 speakers. 4 speakers (zone 1) will be set to 60W. 5 Speakers (zone2) 4X60w 1X10W. I'm looking for a volume control unit (x2) for this setup. Can you confirm whether this item would fit the bill or possibly point me to something that would? Thanks for your time and assistance. Hey I just purchased 6 of these volume controls VMS300 from OSD. I am using them with the following setup and have questions that are in ALL CAPITALS. Can you please help me get this right? Onkyo TX-NR626 I will use the powered Zone 2 (115W per channel at 6OHMs safe) for the output into.... Monoprice 8 Channel Speaker Selector Only 6 channels will be used and the other 2 I will disable (not push the button in) SHOULD I DISABLE IMPEDANCE PROTECTION (not push the button in) ON THE SPEAKER SELECTOR? 6 VMS300 Volume Controls SHOULD I SET THE IMPEDANCE MATCHING AT 8x? 6 pairs Leviton SGC65-W 6.5-Inch Two-Way In-Ceiling Loudspeaker I believe that is a fairly regular routine setup? The only questions were if the speaker selector impedance protection should be disabled and also if the impedance matching on the VMS300´s should be set to 8x. How does OSD Volume Control accomplish this impedance matching? Because my math shows Resistance would equal 1.333 (6 times 8ohm circuit in parallel) Thanks for your help! Hello Steven, The volume control impedance matching will do a more efficient job than the speaker selector's impedance protection, but either would work. The main issue here is that you're running a potentially very low impedance load on a 6ohm limited receiver. Though the impedance feature will help stabilize the ohm load going back to the receiver, it doesn't mean it will be a matching 6ohm load. Tred carefully and keep a close eye on the receiver to check for over heating. Very common set up, although most of our customers are using our AMP300. You can run your receiver into the AMP300 as the source. Hello Marcelo, These volume controls can handle up to 3 pairs of 8ohm speakers but your amp needs to be able to handle that type of load too. Hi Justin, Yes, as long as your amp can handle a 4 ohm load. This volume control can handle up to 3 pairs of speakers as long as the amp/receiver can handle it. Trying to use 2 of these on a single stereo channel pair of outputs off an amp to power 2 indoor and 2 outdoor speakers for 2 zones (stereo in each zone). I think a switch would be redundant since u can just turn down either slider to essentially turn off a zone. The amp will only do as low as 8ohms per channel. 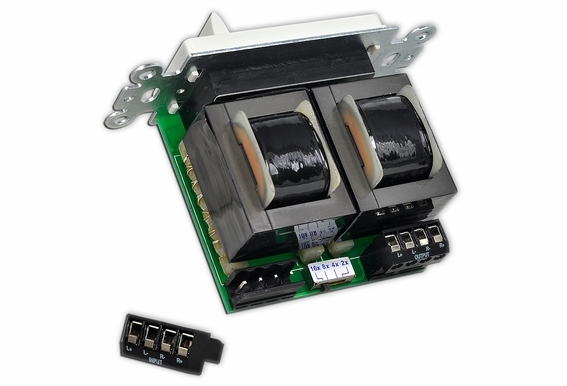 Based on what ive read, it sounds like the amplifier side of these transformers is only 8ohms. The issue is that if the amp side of the volumes are 8ohms, with 2 volume controls on each channel output, the amp would see 4 ohms. Each speaker is 8 ohms. Soooo, can i use the impedance matching to change the amp side and get each slider to show 16 ohms per channel, so that when there is two transformers wired in parallel, each channel on the amp is actually seeing 8ohms? I'm essentially just wiring the exact diagram in the manual that they come with, but its not clear on if the impedance matching function also can be used to adjust the impedance to the amp. Soo- 4- 8ohm speakers. 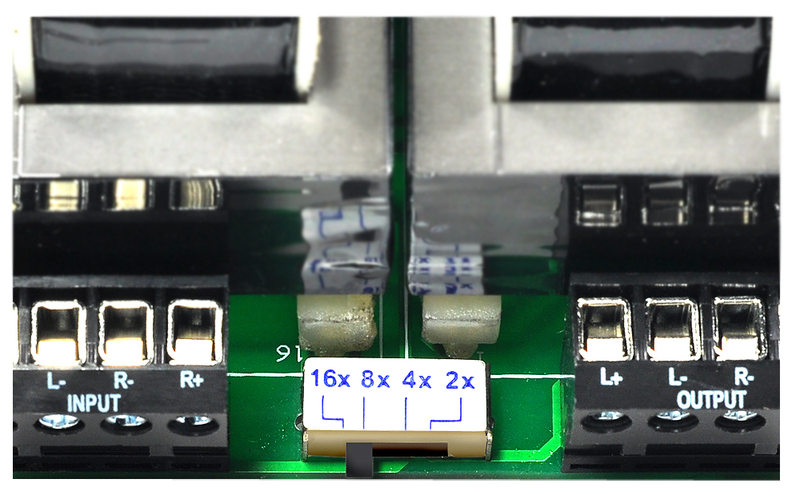 2- 8 ohm amp channels (1 left, 1 right). 2 zones, each with 2 speakers, 1 left, 1 right. And 2 volume faders, one for each zone. 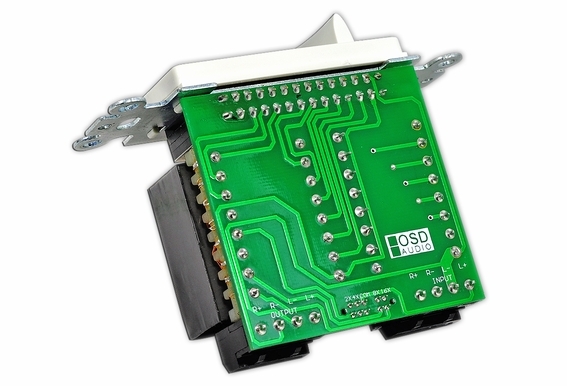 I connected a pair of OSD Audio ACE840 to this volume controller. I then connected the outputs from the receiver (Denon AVR 1905) to the volume controller. When I turn on the receiver the setting on the volume controller needs to be set at the max setting to hear even a faint sound from the speakers. when I turn up the volume on the receiver the it then shuts down within several seconds. I'm pretty sure I have all of the setting correct. Can anyone please shed some light on what the issue may be? Does this volume control work to completely mute a set of speakers? I am hooking this up to a single pair of 8 ohm speakers and there is no need for a impedance matching. The specs, documentation and box all mention a 1x non-matched switched position but I don't see it on the unit. How do I set this unit to non-impedance match throughput? implanning on buying a couple of these, im using a Sony 530watt 8ohm system w two speakers & a sub, but im gonna use these volume switches & add 4 more speakers thorughout the house. how would you suggest wiring it? each switch will have 2 speakers, each @ 6-8ohms. wopuld i just use it as impedence matching for 8ohms or how would you suggest? the system im using isnt able to add speakers to it because it doesnt have actual speaker ports, thier just custom style conenctors, so im just gonna cut off the speakers & run the stereo directly into my wall jacks & then add speakers to each box in the individual rooms. 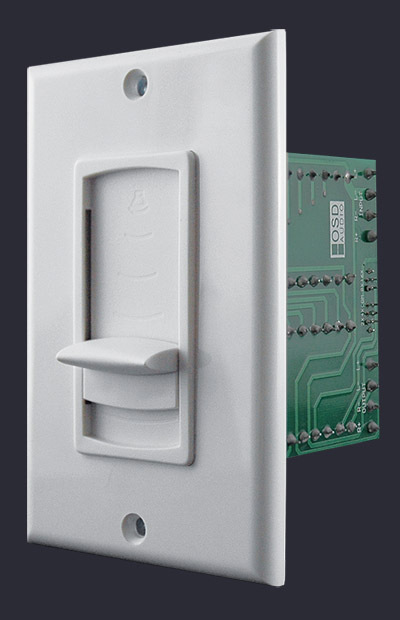 Hi - is it possible to replace the white decora panel with a stainless steel decor panel, or are the decora panels specially designed for the control? And is that the same answer both on the slider and rotary knob designs? I have a pair of 8 ohm outdoor speakers wired in parallel to one channel of a QSC GX3 so that the load is down to 4 ohms. One speaker faces into a neighbor's yard and I would like to be able to turn that one quieter than the other speaker on that line, would this volume control work for this without upsetting the 4 ohm impedance load on the amplifier? Or do you carry another product that would be acceptable for that application?